There’s a new stand up taking a seat on the Leeds comedy circuit at the moment, and the Comedy Cellar at Verve is packed for the latest set from Jonny Brook. Brook brings with him a disability. It means he doesn’t enter a stage with great ease. And tonight, as he hands his crutches to a friend who’s with him, he manoeuvres himself on to a stool with an element of difficulty before grabbing the mic with a “Ta-daaa!” as if he’s just performed a trick. He’s triggered the first raucous laugh of many. An unexpected first line, but one which carries the magic start to a show of self-depreciation stories and close-to-the-knuckle tales. Brook is dry. Incredibly dry. To the point where you wonder if there’s a moist bone is his body. You listen intently, and you’re never ready for the punchline. You can’t tell when it’s coming because of his delivery, but when it arrives it’s consistently a killer line. Every single time. Crucial topics that he covers include love and poetry, a comparison to him and Lady Gaga, and his parents’ divorce. A tricky time for any kid, but when it happened to Brook he was in his thirties, and the conversations between grown-up-child and parent take on a whole new dimension. Well, they did in his instance. The audience cringe with laughter as we hear what father says to son, whilst trapped in a car that’s bombing down the M62. Occasionally cracking a smile, his humour is incredible, and the crowd in the comedy cellar are in hysterics throughout his show. We’re eating out of his hand. He brings up his disability at various points in the show and he’s far from the victim. He’s gleefully monotone in explaining the benefits of not being able to use his legs properly. Whether that be him needing the loo in the train station, or when he’s offered discounts from ladies of the night and it’s difficult for him to up the pace to avoid them. The tales don’t take an obvious turn anywhere, and the style of Jonny Brook absolutely makes his act. But it’s a style that comes so naturally to him. He’s not a character, this is the real him. Tonight has been a priceless journey in dry humour. Brook is a seriously funny guy, with a brilliant act. 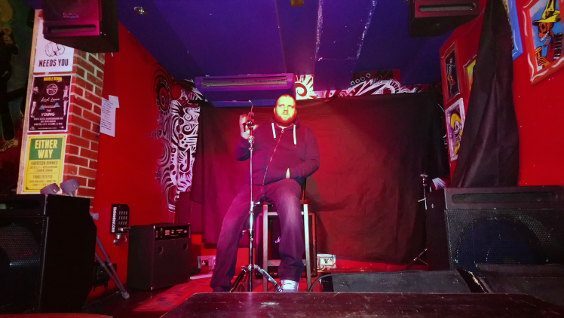 He’s becoming a regular on the Leeds comedy circuit now and, travelling further afield, becoming increasingly popular. And it’s obvious why. Five star humour. He’s worthy of checking out and going to see.